Free worldwide shipping on all orders over £40! We ship our organic yarns from Kaş, Turkey, to just about anywhere in the world! Shipping is free for orders over £40. For other orders, the shipping cost is very reasonable - see rates below. We offer two shipping methods - registered airmail or registered ground shipping. Airmail takes 4-9 days worldwide. Ground shipping is a bit slower (7-10 days) and the cost-saving isn't significant, but we offer it for customers who want to ensure the lowest possible carbon footprint. After shipping, we'll send you an email with your tracking number, so you can monitor the progress of your package. Shipping rates are the same to all destinations worldwide. 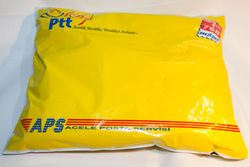 Yarns are shipped in purpose-made plastic airmail bags, as shown here. While we'd love to avoid all plastic, we feel water-resistance is important to protect your wool. They weigh very little, keeping shipping waste to a minimum. When we receive the returned package in full, we will refund your original payment to whichever account you paid with.